Replacing your existing fenders with new fiberglass fenders is fairly easy. The fender is the exterior part of the car that is located above the front wheels of the vehicle. They not only make the car look nice by continuing the sleek look around the wheels but they also protect the wheels from excess mud and debris. Some people want to replace their fenders because they want a new style or look. Others are forced to replace their existing fenders when they are in an accident and the fenders are damaged. Fenders are one of the most common car parts that need to be replaced after a car accident. Whether the fender was dented by a stray shopping cart or in a more serious collision they commonly take the brunt of the blow. One of the reasons the fenders are damaged so easily is because they are located on both sides of the bumper. When the bumper is pushed in or crushed it is often pressed back into the fenders causing them to bend as well. The fenders on cars today are not fiberglass but made of sheet metal instead. Many people prefer the fiberglass fenders for many different reasons. One of the main reasons is how light weight the fiberglass fenders are. They lessen the overall weight of the car and this is especially beneficial for race cars that need to be as light weight as possible. Some fiberglass fenders may weigh as little as 4 pounds a piece which is much lighter than the typical sheet metal fenders that come on cars. Sheet metal fenders are also known to bend and become damaged more easily than the fiberglass. Since they are made of metal they can become dented just like most forms of metal can under pressures. Fiberglass is actually pretty tough and although it can become damaged and need replaced the many layers of the fiberglass tend to protect the underlying materials causing less damage to the rest of the car in a minor collision. Unfortunately the sheet metal fenders bend and the effects of the pressure are often transferred to other parts of the car as well. When replacing your original fender you may find it challenging to find a perfect fit with a new fender. This is because the original factory fender was designed perfectly for your car. Replacing the original fender with a new fender, whether fiberglass or another sheet metal fender, can be a little difficult. For this reason it is a good idea to know how to fit fenders onto a car very well. You may need to make a few adjustments and modifications in order to get the fender to fit properly and look like it belongs on the car. It is often advisable to take your new fender to a body shop that is used to doing work with replacement fenders. Fiberglass fenders may be a little less expensive than sheet metal fenders which may appeal to many buyers and not only are there fiberglass fenders for your car but also fiberglass hoods, doors and other body parts that can make your car look brand new. There are many unique styles of fiberglass auto body parts that you can choose from. 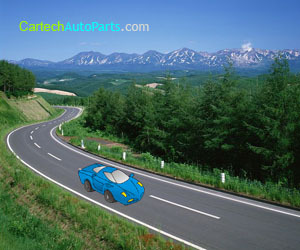 This allows you to be creative and design the exterior of your car to your liking. Not everyone wants the same car on the road, and adding fiberglass is just one way to maximize your creativity. Some people buy a car to serve one purpose only and that is to get them from point A to B while others make upgrading their cars a hobby. Either way, if fiberglass fenders are what you like on your car, then by all means start making the changes to your car today. Using fiberglass for finders is a brillant idea. Fiberglass absorbs a lot of stress which in turn prevents the interior from being damaged.